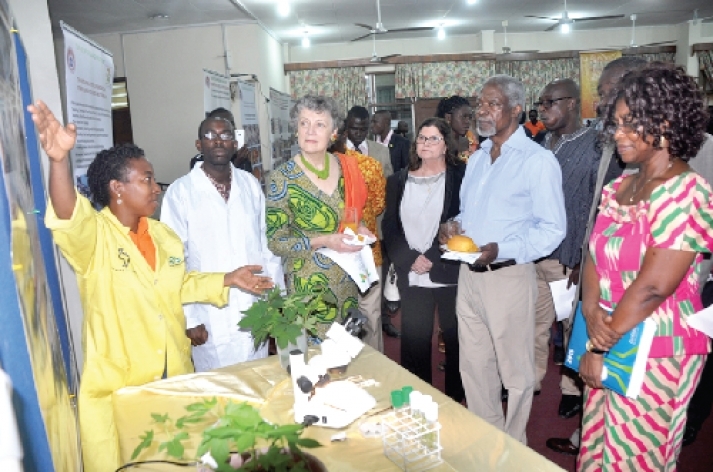 The Crops Research Institute of the Council for Scientific and Industrial Research (CSIR) will be naming a sweet potato after the late UN Secretary-General, Kofi Annan. Senior Research Scientist and Sweet potato and Taro Breeder, Dr Ernest Baafi says it's in recognition of Mr. Annan’s contribution towards sweet potato production through the founding of the Alliance for Green Revolution for Africa (AGRA). The Ghanaian diplomat who served as the seventh Secretary-General of the United Nations, from January 1997 to December 2006, passed away on August 18, 2018, Switzerland. The sweet potato plant belongs to the bindweed or morning glory family, Convolvulaceae. Its large, starchy, sweet-tasting, tuberous roots are a root vegetable. The new breed, AGRA SP-19 or CRI-Kofi Annan, is pending approval by the National Varietal Release Committee of the Ministry of Food and Agriculture. Since 2012, the institute has released thirteen (13) high yielding and early maturing varieties. Despite the strides, the crop has enjoyed low level of utilization because of the sweet taste of the recently introduced orange fleshed type, rich in a substance known as beta carotene, which leads to production of vitamin A. The high water content has limited their consumption as staple food. Meanwhile, the institute released three sweet potato varieties in response to the demands. The potatoes approved by the National Varietal Release Committee comprise two less sweet varieties and one less sweet orange-fleshed sweet potato. The sweet potato’s staple-blunt taste and low water content, makes it ideal for preparation of local Ampesi meal, Fufu flour, baby foods and potential enzyme soured for breweries and other industries. “It has dry matter between 36-46 per cent so it won’t be soggy when it’s fried,” Dr Ernest Baafi revealed. The new varieties are high-yielding and tolerant against Sweet potato virus and the sweet potato weevil as well as acidodes. Dr Baafi believes the newly released varieties will boost government’s agenda such as Planting for Food and Jobs as well as One District, One Factory.